Give your home a touch of classic charm with this Euro sham. Featuring eyelet lace edging and a light, airy cotton fabric, the sham provides an heirloom, ruffled appeal that complements both traditional and shabby-chic decors. Like I said about, I would have given this product 5 stars, except that the material is thinner than I would have expected. 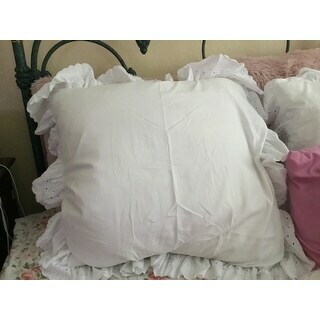 But it fit my euro pillow perfectly, washed and dried with no problems, and looks really good with the matching dust ruffle. If you're looking for a true cream color, this isn't it though. It is a very subtle cream, but again, very pretty. The fabric was very thin, there were lots of loose threads, and the eyelet was puckered in several places due to poor sewing construction. I sent them back. I cannot recommend these shams. Love Love Love these Euro Shams, I have been looking around for awhile for shams and made the decision to buy this one. They are so pretty and the color is perfect and the ruffled eyelet makes it look even prettier. If your planning to buy this don't think twice. I'd read some earlier reviews about this item, and yes, the covers and the lace trim are "floppy". I didn't really care about that. I ordered the European Sham size in Ivory, to replace some "kitten destroyed" covers on my couch. These fit perfectly. They also matched the ivory throw I bought from Target to cover the rest of my couch. This combo was incredibly cheaper than paying to recover the whole couch professionally. Overall, I have a very nice shabby chic look to my couch now... these would not be something for someone who wants a crisp pressed look. The eyelet is beautiful, by the way. The only thing others might not like (besides the floppy casual look) is, the body of the cover is a bit on the thin side. The Euro white eyelet shams are a great complement to my Phoebe Midnight shams. Beautiful, just wish that I could get the ruffles to stand up on the pillow. Great buy anyway! I am disappointed in the fit of these euro shams. They fit very loosely and sloppy. The other euro shams I have purchased in the past have all had some sort of closure to keep the sham in place. These do not, so the pillow practically falls out if you don't have the opening at the top. I liked this sham very much. It is plenty big enough for my euro pillow. The eyelet trim is prettier then it looks in the picture. I am going to order another one so I have a pair. the fabric is nice for use as a pillowcase too. I sleep on my euro pillow, so this pillowcase is perfect for sleeping on and for decorative display too. Good price for Euro shams, just what I was looking for. These shams fit well and match my bed skirt. 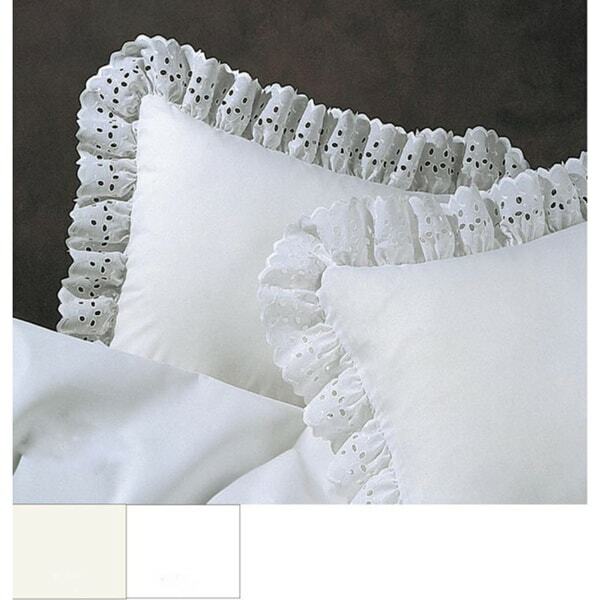 They look fine, but the eyelet ruffle is floppy, and when the pillows are displayed on the bed, the ruffle can't be seen. Well made and lovely ruffled eyelet Euro shams. They complement country style guest bedroom perfectly. Definitely recommend. These are great quality cotton and very pretty eyelet lace. Love , love ,love! This sham is very pretty on my bed. It really makes my bed look feminine. The material is a little thin and looks better if ironed. I bought two of the sham cases and the matching bedskirt and they're high quality and very pretty. Received substitute sham by FRESH IDEAS and they were 100% polyester, and poorly made and not the correct size (too large). I called Overstock and they are going to replace these with the Lauren shams, and I am sending these back. If you order shams tell them to be sure to give you the Lauren ones. Just like picture also like the picture beautiful addition to the quilt I ordered for the summer.. shipped fast.. very happy. i love these shams. They look beautiful on the bed. These shams were exactly what I was looking for in so many stores! The eyelet is perfect and strong, and the color is just the right heu. I bought these shams to go with the matching bed skirt from overstock. The shams and the skirt are great! The material is super soft to the touch. My on issue is that the fringe on the edge is a good 4 inches wide and because the material is so soft it doesn’t stand up. Overall, great purchase!! EURO SHAM IS A BEAUTIFUL COMPLIMENT TO THE STANDARPILLOWS AND MATCHING BED SKIRT. I’m dumb. I thought euro was the name of the style of case, I didn’t realize it was a pillow size. I had to buy a euro pillow to put this on because I love the pillow case, it’s gorgeous. I love these covers! They are chic and fit really well with my farmhouse decor. They are also well made. I love the lace! These shams, coupled with the Lauren bed skirt, brighten and feminize my room. They are good quality and well made. I think the feelings you should get when you go into your bedroom are a sense of safety, familiarity, comfort, and a reminder that here your presence is recognizable, welcoming you to relax. These eyelet pieces do that for me. Love them! They go perfectly with my bedding. I really like the Euro shams since they go perfectly with any bed set. When the regular queen size pillow shams don’t meet, I put it over the middle and then a decorant pillow in front. I have two that I always use. "Are these pillow shams available with a 21 inch drop bed skirt? In white. Thanks! " they look nice and I like the eyelet border better than the floppy border on most other shams. "Is this one or two shams?"